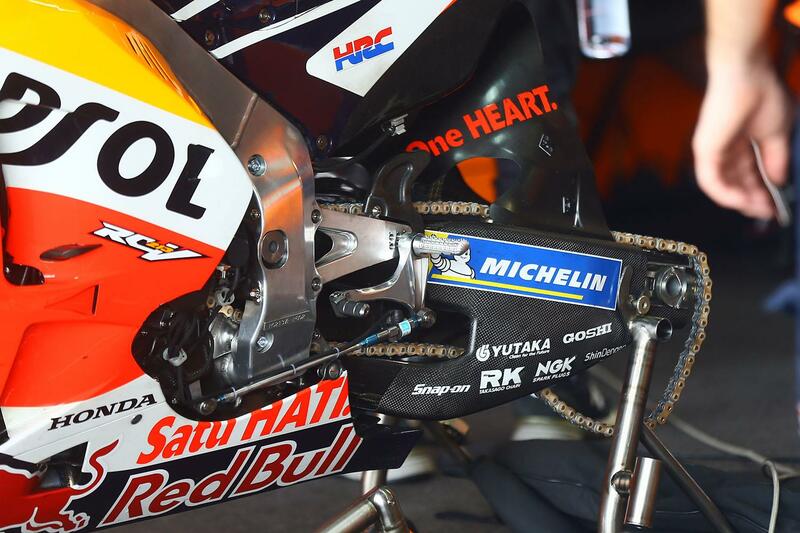 The Repsol Honda duo of Marc Marquez and Dani Pedrosa have been secretly testing a new carbon fibre swing arm on their RC213V machines at both of MotoGP’s official pre-season tests in Malaysia and this week in Thailand, running the revolutionary new part intermittently during the test. Various teams have experimented with carbon fibre chassis parts in the past, most notably when Ducati ran a carbon frame as far back as 2009, but the project was dropped after riders complained about issues surrounding the stiffness of the material. However, MCN’s sources have revealed that both Marquez and Pedrosa have been thrilled with the new component when they’ve trialled it so far at both tests, with Pedrosa rumoured to have set the lap time that left him second quickest overall yesterday using the component.